Advertising today is completely different than it has been at any point in history. The reality of today’s digital style of advertising and marketing is that massive, groundbreaking changes are commonplace. It is not uncommon to completely overhaul your digital strategy after a Google update. Whereas in the past marketing was enhanced and/or changed only occasionally, based upon relatively infrequent technological innovations, the internet and technology of today are constantly evolving. Since I graduated and started in search marketing in July of 2012 there have been 53 updates to Google’s algorithm! Recently, the most notable of the developments in AdWords was the changing of their ad format. Where they once showed 3 ads at the very top and 8 down the right hand column, there are now 4 ads ad the top with none on the side. Since this change, many advertisers have seen their traffic drop, or their cost go up. With more competition vying for less space, how can one get that share of the market back? The answer for me has always laid with the extensions that AdWords offer, but now this is doubly true with the update to AdWords Location Marketing. Research from Google suggests that 60% of customers will use the information contained in those extensions to contact your hotel. If your hotel makes use of the AdWords location extension, they can expect to see an increase in website visits. All of this by just adding 1 simple extension! Google’s latest AdWords update, which once again directly relates to location marketing, isn’t overly complex; however, its effects in both the short and long term are notable. Essentially, this update allows AdWords to carry over to local location searches. For instance, Google Maps was previously regarded as a service/branch of Google that was completely off-limits from advertisements from specific businesses and professionals; if an address or establishment was searched for, results came up in organic results, and that was it. 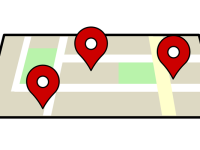 Now, when an individual searches Google Maps for a specific address or particular type of business, advertised businesses can appear, based upon not only the keyword which was searched or the keyword of the address that was searched, but the geographic location of the searcher as well. Simply put, business owners who make use of Google’s AdWords location extensions can have their ad exposed to a number of local, interested, and viable potential customers by making this simple adjustment. This means that more impressions are much more likely to lead to additional business. Now that the details of Google’s AdWords Location Marketing update have been covered, let’s take a look at why you, as a hotelier, should make use of them. There are quite a few viable and highly notable reasons as to why every single hotel owner who is interested in maximizing business and profits should utilize AdWords Location Marketing. First, this Adwords extension encompasses the best of convenience and targeted advertising—a major plus for potential customers. Unlike many regular AdWords campaigns, location marketing allows those searching for a specific establishment’s location or information, obviously relative to their own current position, on Google Maps to view advertisements along with their regular search results. For instance, if a Google Maps user searches for “hotels in Dallas”, an establishment, which has properly researched their AdWords, could be placed at the top of the results list. As was said, this is a big deal because it’s made your hotel hyper-accessible and so convenient. Potential customers can view an advertised establishment’s phone number, address, and review rating within the same window as search results. It’s a means to finding new hotels (or businesses generally, for other searches) without the normal hassle of doing so. The reality of booking a hotel stay, from the perspective of a customer, is that there’s a lot to worry about. Will the room be clean? Will the staff be friendly? Will the other guests be orderly? Will the establishment be generally well kept? These are all questions that customers undoubtedly fret over before staying in a hotel. However, the first establishment that they patronize that doesn’t necessarily impress them, but satisfies all of the above questions, may be their go-to for many trips to come (be it a specific hotel or a brand). That’s why AdWords Location Marketing is so important—it allows hotel owners to market their business to previously uninterested (or so they thought) customers. If a particular establishment offers better accommodations, better service, and more charm for a lower price than the competition, it probably deserves additional business. This information, in relation to Google Maps, represents only a portion of the AdWords Location Marketing possibilities; there are a number of other ways that these promotional tools can be benefitted from. To explore these, in part, and to help adapt your current marketing strategies to encompass location data, let’s take a look at how you can tie this information in with your current advertising efforts. As has been made apparent through recent promotions, the possibilities are endless when it comes to location marketing. While it wouldn’t be fair to tell you how to market your business, a viable promotional model (because of location marketing’s geographically specific nature, probably isn’t being used in your area) can be highlighted, along with an industry professional who can cover all of your marketing needs and then some. Your hotel could be tied-in with a local business (or multiple businesses) that is/are known to provide high-quality services; using very specific geographic marketing, each of these establishments can provide additional support to the other. For instance, those staying in a hotel may be interested in local activities—museums, arcades, monuments, etc.—while those enjoying such activities may be interested in accommodations (at the very least, for a future stay).